To get a quotation as to what it would cost you to go on holiday in one of the Schengen countries, fill out the form below. Travelling to Europe? Chances are you'll need a Schengen visa (if you're travelling to one of the 26 Schengen countries). Luckily you only require one visa to gian access to large parts of Europe. Find out how to apply for a Schengen visa in South Africa below. The Schengen countries in Europe have no passport controls for travel between them (except temporary security controls on some borders), which make them a joy to travel between, as only a single Schengen visa is required. The Schengen visa is also known as a "short stay visa" as it allows for a maximum of 90 days travel. Note that even if you do get a Schengen visa, you can still be denied entry by border control - this is at their discretion - so make sure that you have all your paperwork with you when you travel, so you can at least argue your case. Please note that as South Africa Travel Online is not a registered visa handling agency, all information provided should be confirmed with the relevant embassy. While we have endeavoured to ensure that all information is correct at the time of publishing, mistakes could have been made. Individual countries are also at liberty to make their own arrangements and rules regarding the application process and these aren't always communicated timeously to us. If you need to apply for a new passport, in our experience you can usually get it within 10 days from South African Home Affairs (but be prepared to queue for a long time - this can take you the better part of a day). Do apply as long in advance as possible though, as there are rare cases of extreme delays. Temporary passports are no longer issued. You can find your closest home affairs office by clicking here. Passports must not be older than 10 years as South African passports expire after ten years. South African passports must be valid for at least 3 months after the date of return to SA (why the need to have it valid after your return date? Well, governments tend to err on the side of caution, factoring in any unforeseen circumstances which may occur). The passport must have the applicant's signature on the relevant information page (newer SA passports already have the signature embedded on the hard cover; Older SA passports must sign the information page at the back). Passports require 2 valid, blank and consecutive pages (marked VISA). Visa pages are invalid if damaged or stained by stamps from other pages. Please note, visas cannot share the same page back to back. Copy and Original of valid South African permit (permit must also be valid for at least 6 months from the date of return). Copies of any previous Schengen visas that have been issued in last 3 years, even if in another passport. Step 1: Do you need a Schengen Visa? Next, you need to establish whether you require a Schengen visa. Are you visiting one of these countries: "Austria, Belgium, Czech-republic, Denmark, Estonia, Finland, France, Germany, Greece, Hungary, Iceland, Italy, Latvia, Liechtenstein, Lithuania, Luxembourg, Malta, Netherlands, Norway, Poland, Portugal, Slovakia, Slovenia, Spain, Sweden, Switzerland?" Visit our UK visa guide if you need to apply for a UK visa as well. Note that you may also need a Schengen visa if you are visiting a French overseas territory : Guadeloupe (Saint Martin, Saint Barthélémy), Guyane, Martinique, La Reunion, French Polynesia, Mayotte, New Caledonia, St Pierre & Miquelon, Wallis & Futuna and the TAAF region (Terres Australes et Antarctiques Françaises). Even though they are not officially part of the Schengen area, Monaco, San Marino & the Vatican do not have passport controls with the Schengen countries which surround them. Are you a special case? Diplomat traveling on official capacity? Going to Reunion Island for up to 90 days? You are transiting via an airport in a Schengen country and aren't planning on leaving the airport. Have you already got a Schengen visa covering your entire trip? 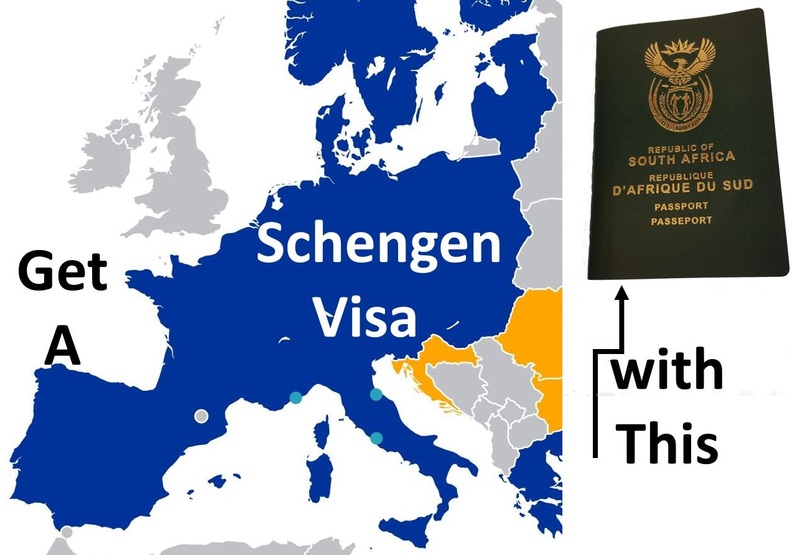 If you have only a South African passport, and you are not a special case, and you are visiting one of the above countries, then you need a Schengen visa. If you are a special case you probably wont need to get a visa, but we suggest you double-check with the relevant embassy. Europe is not a single country. Not everybody in Ireland has red hair and freckles, river dancing isn't huge, they don't all love potatoes; but Catholicism is still a fairly big deal and they do drink a lot. Not everybody speaks English, and speaking louder doesn't help them understand. You can win over almost anybody by attempting to speak their language - learn how to say hello, please, yes and no. Younger people are more likely than older people to speak English. Do not mock those trying to speak English - congratulate them. The English are thought of as being drunkards, entitled and xenophobic. If you hear somebody singing "Allahu Akbar", it's probably just a call to prayer, and not a suicide bomber. Do not light your cigarette from the flame of eternal light at the grave of the unknown soldier, under the Arc de Triomphe. In Germany do not greet people by raising your right palm with the Hitler salute - people don't think it's funny and it may get you arrested. German history did not begin with Hitler. Don't take selfies in front of memorials for murdered jews. The trains don't always run on time. In Bavaria everybody is not drinking beer all day. If you ride on a train between countries then you are going to need your passport and visa. Do not use the phrase "Polish Concentration Camps". There are no polar bears in Poland. Do not drink their Vodka - you may not come out alive. In Finland do not go sit next to somebody on a bus if there are other seats available. Northern Ireland and Ireland are 2 different countries (and Northern Ireland is not part of the Schengen area). If you are black and visiting Eastern Europe, then don't get offended if people stare at you - many haven't ever seen a black person. Do not go to Romania seeking out Dracula - it's a made up story. Do not touch the monuments, or write on them - nobody cares that Sue loves John. Portugal is not part of Spain and neither is Gibraltar. Barcelona is part of Spain, but doesn't want to be. Do not make jokes about people being hungry (in Hungary). Not everybody in Amsterdam smokes dagga. The country's name is "The Netherlands", not Holland (although two of the provinces are called Southern Holland and Northern Holland). If you are visiting only one Schengen country, then naturally you'll apply for your Schengen visa via that country. If the main reason for your travels are to conduct business in a specific Schengen country, then you should apply for your visa via that country. If you are travelling to more than one Schengen country, then you'll apply for your Schengen Visa at at the embassy of the country you'll be staying in the longest (if you're visiting the Schengen countries for equivalent lengths of time, you apply at the embassy of the Schengen country you're entering first). Whilst you apply via a specific country, when applying you will also need to specify which countries you are visiting when you apply for the visa, so you, theoretically speaking, can't roam around the Schengen Area as you please. Many travellers enter the Schengen Area in a different country to the one with whom they applied for the visa, because airlines use international hub airports. For example, if you're flying KLM from Johannesburg to Frankfurt you'll enter at Amsterdam. General documents required might include (but is not limited to) your flight or cruise itenerary, proof of accommodation, letter of employment, proof of residence, bank statements, visa photographs and so forth. Gather the documents. The Schengen application form may be obtained whilst booking your appointment online. Some countries accept this online form, which is much easier to complete, and other still require the old form that has to be completed in pen. It is best to confirm with your visa application centre. Schengen visas currently (Jan 2018) cost 60 euros plus whatever additional fees the Visa handling agency charges. As part of the online booking process, you'll be able to see what the availability is of dates for your appointment. Make sure that you are able to apply for your visa at least 15 days prior to departure as some countries won't even consider an application in less time, despite the fact that visas are often issued in less time. Meet up for your appointment with all the documents required (as specified above). Allow youself additional time and try to get to the application cente about 15 minutes before your scheduled appointment, as many agencies will require you to make a new appointment should you miss the first. You will be required to submit biometric information (photographs and fingerprints). Your application will then be sent to the relevant embassy/consulate for processing. At the moment fingerprinting is only done for people aged 12 and above; however authorities are considering reducing the age to 6. If you have applied via Capago (who represent Italy and France), then they will email and sms you when your visa is ready. You will have opted to either collect it yourself (bring your SA identification document with), to have it couriered to you (extra cost, and may take a bit longer), or to have an appointed representative pick it up (in this case they will need a copy of your ID, of their ID, and a form signed saying that they can pick it up). Applications must take place not more than 3 months and not less than 15 days before your intended visit. Since the 6th June 2013 fingerprints are required, meaning that you need to appear in person at the embassy or consultate. A South African Passport, not older than 10 years, with at least 2 blank pages and valid for at least 3 months after the date you leave all Schengen countries. Temporary passports are not recognised by many Schengen countries. Two colour photos which meet the Schengen requirements. If you are travelling elsewhere before returning to South Africa, you'll need to get the visas of the country which you're leaving the Schengen countries for, before you apply for the Schengen visa (e.g. if you're going to the UK after visiting the Schengen countries). Proof that you paid the visa fee. Copy of round-trip airline tickets & itinerary, specifying when you're entering & when you're leaving the Schengen area. Bank statements for the last 3 months, to prove sufficient funds (the amount required varies by country). Provide proof of travellers' cheques, tax receipts for any forex bought and credit card statements or an original letter from the bank showing proving the credit amount. Proof that you have the minimum Schengen Travel Medical Insurance. Proof of your hotel bookings. If staying with a friend/family, an invitation letter with a copy of the host's passport/ID. If travelling on business, a letter from your employer stating why you're visiting as well as a letter from the company in the Schengen country you're going to. If you're going to a conference, then send proof of payment and registration. The unabridged birth certificate of children younger than 18 - this contains full particulars of the of the individual, parents, ID numbers, names in full, city/town of birth & their citizenship. The abridged certificate, by contrast, only shows the child and mother's ID numbers, names of birth and country of birth. A document providing consent should be provided by any of the child's parents not travelling with the child. South Africa has only been issuing unabridged birth certificates since 4 March 2013. Proof of employment in the form of a letter from the company you work for, stating your period of leave and that you'll continue to be employed when you get back. It's entirely possible that these rules have changed since this page was published, and it's therefore crucial to check with the relevant embassy for latest rules before applying. The Schengen visa allows a maximum of 90 days travel in Schengen countries you've applied to visit, for every 180 days period. It can be single or multiple entry. The day of your arrival and departure count as full days towards the 90. If you leave the Schengen area in the middle of your travels then those days don't count towards your total of 90 days (e.g. if you go to London for 5 days). Visa applications must be made through VFS Global in Cape Town, Johannesburg or Durban. Visa applications must be made through TLS Contact in Cape Town or Johannesburg. Visa application must be made through VFS Global in Cape Town, Durban, Johannesburg or Pretoria. Visa applications must be made through VFS Global in Cape Town, Durban or Pretoria. Eastonia doesn't currently issue visas in SA, use the Swedish Embassy. Embassy Pretoria (012-343-0275) or sanomat.pre@formin.fi. French Consulate - Gauteng, KwaZulu Natal, Free State Regions (011-778-5600) or visas.johannesburg-fslt@diplomatie.gouv.fr. Visa applications must be made through Capago in Cape Town, Durban, Johannesburg or Port Elizabeth. Visa applications must be made through Intergate Visalink in Pretoria, Cape Town, Bloemfontein orPort Elizabeth. Visa applications must be made through GVC World: Greece Visa Application Centre in Johannesburg, Cape Town or Durban. Embassy Pretoria (012-430-3030) or consulate.prt@mfa.gov.hu. Iceland is represented by Denmark in South Africa. Italian Embassy Pretoria (012-423-0000, segreteria.pretoria@esteri.it, 021-487-3900, consolato.capetown@esteri.it). Visa applications must be made through Capago in Cape Town, Durban, Pretoria or Johannesburg. You can phone them at 087-231-0313 if there are any difficulties. "My Italian visa was ready after 3 working days. The people at the embassy are not very friendly and will make it known that they are not there to help you but I still got my visa." Latvia is represented by the Hungarian Embassy in South Africa. Pretoria Embassy (012-760-9000) or amb.za@urm.lt. We can't currently confirm the application method, so it is best to confirm with the Embassy. The Luxembourgh Consulate in Johannesburg no longer issues visas. Luxembourg visa applications must now be made through the Belgian Embassy. Malta is represented by the Italian Embassy in South Africa. Visa applications must be made through VFS Global in Cape Town, Durban, Johannesburg or Pretoria. Visa applications must be made through VFS Global in Cape Town or Pretoria. Visa application must be made through VFS Global in Cape Town, Johannesburg, Pretoria or Durban. The consulate of Switzerland in Cape Town represents the Slovak Republic for South African applicants domiciled in the Eastern Cape, Northern Cape and Western Cape. Eastern Cape, Northern Cape and Western Cape applications must be made through VFS Global Cape Town. Gauteng applications must be made through the Embassy in Pretoria. Slovenia visa applications must now be made through the German consulate. Visa applications must be made through BLS in Cape Town or Pretoria. This also applies for Baleares and the Canary Islands. Visa application must be made through VFS Global in Cape Town, Pretoria and Durban. Visa applications must be made through VFS Global in Pretoria, Cape Town or Durban. Under Article 25 of the European Union Visa Code, it is possible for a Schengen Visa to be issued which is not valid for all member states! If your Schengen Visa says something like "ETATS SCHENGEN ( - DE)" on it, this means that you can visit all Schengen countries except Germany (DE is the code for Germany). This does not however mean that the illegal practice of visa shopping, where a person chooses to apply for a Schengen visa through a country other than the one they will be visiting either for ease or to save cost, is encouraged. Always apply for your visa through the correct country! Do not be surprised if there are border checks even when crossing borders within the Schengen area. 27 Sep 2017. The EU releases plans to allow countries within the Schengen Area to introduce border controls for up to 3 years, for security purposes. Previously, they have only been able to implement the controls for a maximum of 6 months. In October 2011 the Visa Information System was implemented, which links all the border agencies of Schengen countries to a central system to allow visa applications to be cross-checked against it, and to share all information. The Schengen visa does not allow you to work. 10 December 2018. Today the European Parliament voted in favor of an updated EU Visa Code. The proposed changes came about after a lengthy consultation process with industry and includes the following: An increase in the visa application fee to 80 euros, it will allow for visa application up to 9 months before departure and the minimum process time will be reduced to 10 days. The next step is for the European Parliament and the European council to reach an agreement on each of these issues. Despite the increase in cost, we believe this will be a major win for South African travellers. 7 October 2017. Border control police are now scanning in all travellers' passports - previously only a small fraction of travellers had their passports scanned in. 23 September 2017. Dutch Security Minister, Stef Blok, has said that from 2018 all airlines will be required to do identity checks when passengers check in to flights; to prevent terrorists from freely travelling around Europe. 21 July 2017. Flying in from Tunis, a Danish woman is refused entry to Brussels because she would not remove her niqab; and the immigration police could therefore not identify her. September 2017. After an International Tribunal rules on a disputed border in the northern Adriatic waters, Croatia says the results were influenced by a Slovenian official discussing it with a member of the arbitration commitee, and that it wouldn't abide by it. 12 June 2017: In the runup to the G20 meeting in Hamburg, Germany has begun conducting border checks - they are permitted to do so under the Schengen rules, if there are security issues. 1 June 2017: Ukraine visa waiver: The Ukraine isn't part of the Schengen area, but there is some good news for Ukranian citizens - the European Parliament (EP) voted to allow Ukrainian citizens with a biometric passport to enter the Schengen area for up to 90 days for the purposes of travel, visiting family, visiting friends or business (but not to get a job). With the EU Council of Ministers formally approve the resolution, it came into effect in May 2017, and the first day of visa free travel was the 11th June 2017. 7th April 2017 : Stauncher border checks : EU officials implemented stauncher border checks to help "protect the EU from terrorism", targeting travelers of all nationalities (including EU citizens). The new rules required checking of IDs and passports against anti-terrorism databases; and resulted in queues at border entry points into the EU. 9 April 2017 : Following large delays at its airpots, Greece has suspended implementation of the stricter border checks for 6 months. Greece will continue to conduct in depth checks against suspicious travelers; as allowed in an article of the Schengen rules. The same article has been invoked by Bulgaria, Croatia, Finland, Italy and Hungary. 1st April 2017 : Georgia visa waiver: those holding Georgian passports may travel visa-free into the Schengen area. Statistics show that in April 2017 there were 11,700 Georgian passport holders who traveled to Schengen countries, with 26 being prevented at the border from entering the Schengen area. 5 April 2017. Long queues of at least 3 hours formed at the border between Spain and Gibraltar, which the Gibraltar government say they will be questioning the Spanish parliament about. possible relaxation of requirement to meet in person for people who have visited the Schengen Area before. Wider use of multiple entry visas. The majority of travellers to Europe like to book within 30 days of their trip. South Africans are the exception to the rule - 57% of us like to book at least 1 to 3 months before the trip and 11% 3 to 6 months before (29% book within 30 days). Travellers from the Middle-East & South Africa stay in the longest in the Schengen Area, at an average of 10 nights. The number of South Africans being issued with Schengen visas decreased from 2011 to 2012. An increasing number of South Africans are taking out multiple entry visas to Schengen countries. 33% of the time dependents are required to produce marriage certificates in their application. Nearly 20% of South Africans travel to Europe as singles, whilst in other countries it's fewer than 10%. China & South Africa have the highest proportion of visa applicants who feel it is a problem to have to show up in person at the embassy. 65% of South Africans think the cost of a Schengen visa is an issue. 2015-12-07: With the growing ISIS threat, EU countries have called for greater border controll. Please take into account that countries are on high alert and make sure that you have all the required documents ready for inspection. Also keep an eye out as the future of the Schengen Visa has been questioned of late. 2015. The European Parliament decides to allow United Arab Emirates citizens to travel visa-free to the Schengen areas. 2013-07-11 Czech Republic Gaborone Consulate Closed : Due to the absence of Mr Branko Cavrić (the Honorary Consul), the Czech Republic's Consulate in Gaborone (Botswana) will be closed from the 1st July 2013 to the 2nd August 2013, and then again from the 31st August 2013 until the 7th September 2013. During these periods queries should made to the Pretoria Embassy of the Czech Republic. On the 26th March 1995 the Schengen Agreement came into being when it was signed in a sleepy village on the south-eastern border of Luxembourg called "Schengen". To be precise, it was signed on a boat, the MS Princesse Marie-Astrid, at the point where France, Germany and Luxembourg meet on the river Moselle. Everybody has the right to appeal the decision; and naturally you'll need to construct a case based on facts and legals. There will be a time limit within which you must submit your appeal (varies from country to country). There shouldn't be a cost to making the appeal, other than ones you take on yourself (e.g. hiring a lawyer). It can take quite a while for the appeal process to happen, e.g. 6 months. Apply for a review (remonstrance): Put forward your case, together with a written explanation and attaching relevant documents (this could be via email), to the embassy/consulate and ask them to reconsider on the basis thereof. A different official will then see if the decision should be changed. You will usually get a reply within 3 months days, and you should apply within 30 days (may vary per country) of the embassy's decision to refuse you a visa. If the embassy decides to grant you a visa, there may be certain conditions attached, e.g. the provision of a valid return flight ticket. If you're wanting something more permanent, why not apply for residencey in an EU country. Pay an administrative fee to apply. Demonstrate you have sufficient medical insurance & are financially self-sufficient. Spend no more than 183 days a year overseas away from Malta. Pay a minimum tax of €15,000 per family, per annum. In 2010 Latvia legislated that foreigners who buy property worth at least 70,000 Euros in Riga and surrounds can obtain a 5-year residency permit. In October 2012 Portugal changed its law to allow anybody who buys a residential property for €500,000 or a commercial property for €680,000 to obtain a residence visa. Owners may spend only 6 months per 12 months travelling around the Schengen Area, the remainder of the year they must be in Portugal or outside the EU - only 1 week has to be spent in Portugual in the first year and 2 weeks in the second. Owners don't have to live full-time in their properties and can rent them out when they're not living in them. The residence visa is valid for a year, and then can be renewed twice for 2-years each time, and at the end of the 5 years one can apply for a Portuguese passport. Children younger than 18 and spouses may also apply for residence. Spain has a residence arrangement in exchange for investment. Children younger than 18 and spouses can also apply for residence. Most enquiries have come from South Africans. Cyprus & Ireland are not part of the Schengen area, but also have residence arrangements in exchange for investments. Click here to read our article on how to get an Indian visa if you're South African. Not all EU countries are part of the Schengen area, and to visit those you'll have to go through the normal visa application process - the 6 outsiders are Bulgaria, Croatia, Cyprus, Ireland, Romania & the UK. Even though the UK & Ireland aren't part of the Schengen area, they are part of the Schengen information system. Of the 6; Bulgaria, Croatia, Cyprus and Romania are obliged to eventually join the Schengen Area. So, you cannot fly to London on a Schengen visa! In fact, you'll need a UK transit visa even if you're only there for a few hours on your way (unless you're transiting to specific countries). Bulgaria and Romania are in negotiations to become part of the Schengen area (Romania joined the EU in 2007). The European Commission believes the countries have been ready since 2010, but they have been blocked by several member countries who have cited corruption, organised crime and poor border controls. When they're eventually allowed in, it's possible that airports are first allowed to enter the Schengen Area, followed by the land border at a later stage. 18 January 2018: Austria has undertaken to support Bulgaria's application to join the Schengen area. 23 June 2017: Greece has reaffirmed its support for Bulgaria joining the Schengen Area. 24 June 2013: Lithuania Supports Romania & Bulgaria: Lithuania has confirmed that it still supports Romania & Bulgaria's applications to join the Schengen Area: "Minister Linas Linkevicius reaffirmed the support for Romania and Bulgaria's Schengen accession and the idea was also unequivocally voiced that the subject remains a priority on the agenda of the forthcoming Lithuanian EU Presidency. Practically, the full support was reaffirmed without a shred of doubt, as in the message conveyed to the Romanian foreign minister during his Baltic tour and in Lithuania in particular." said a spokesman for the Romanian Foreign Ministry. No date has been Cyprus to join, there are issues surrounding the conflict between Turkish & Greek Cypriots around the self-declared nation of Northern Cyprus. If all goes to plan, Croatia will eventually become part of the Schengen Area. However, they have a border dispute with Slovenia, and Slovenia says it will block Croatia from joining until the border dispute is resolved. You can phone the Croatian embassy at 012 342 1206. 19 January 2018: Italy confirms that it will support Croatia's bid to join the Schengen area. Serbia is not part of the Schengen area, so you'll need a separate visa to visit the country. Kosovo is not part of the Schengen Area or even the EU, and it is the only nation in the Balkans which does not enjoy visa-free travel to the Schengen Area. A border dispute between Montenegro and Kosovo needs to be resolved before Kosovo will be considered for visa-free travel. Many of these countries can be entered on a valid Schengen visa though, provided that you can prove you have entered the country that issued the Schengen visa. Please confirm whether this will be allowed with the country you are visiting. Note that the conditions for the provision of a visa longer than 90 days are not uniform across countries in the Schengen Area. So, you would apply for a student visa at the country you intend studying in. NATO faces a lot of red tape if they wish to move military equipment across borders of Schengen countries - e.g. specifying the details of what's in each truck and the drivers. This contrasts with Russia's ability to move forces around with lightning speed. US generals want to be able to match Russia's efficiency by creating a military Schengen area.